To request an inspection and free insulation estimate, call Oliver at 1-877-757-1141 or click below! What makes our cellulose insulation “greener” than others? All types of building insulation can be considered to be “green” products because they save energy, reducing harmful carbon emissions that result from burning fossil fuels. But our unique cellulose insulation belongs in the category of “super-green” insulation materials because it contains up to 85 percent recycled paper – materials that would otherwise be dumped in landfills. The reclaimed paper is processed in grinding machinery that creates a fluffy, lightweight material with insulation value as high as R-4 per inch. Cellulose requires significantly less energy to manufacture than fiberglass insulation. Manufacturing fiberglass for a home consumes six times more energy than manufacturing cellulose to insulate the same home at the same R-value. 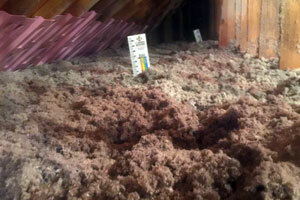 Oliver’s technicians will help you choose the right type of cellulose insulation for your home.